This week I’ve been experimenting again with the beta release of Proxmox VE 2.0. After getting used to the new management interface, we decided to start playing a bit with the “new” cluster architecture. 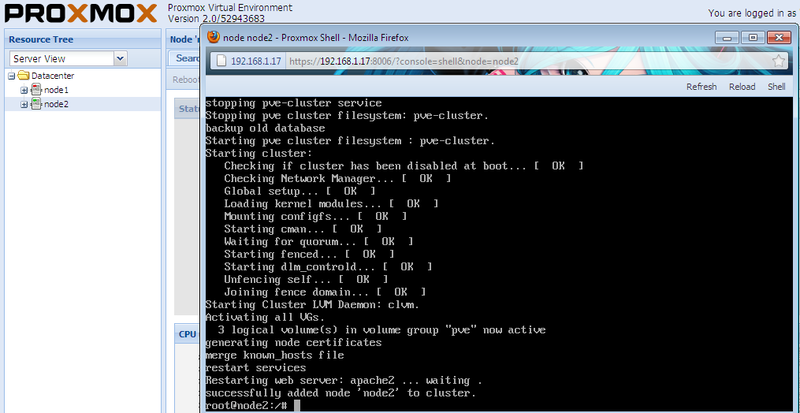 The new cluster model is based on a new “Proxmox Cluster file system” (or in short pmxcfs). To simplify, this file system (database-driven) will be able to replicate in real time configuration files of a proxmox ve node to the otner proxmox ve nodes (using the corosync technology). Using this technology, there will be no more master/slave cluster model but a multi-master cluster architecture. I’ll not go into too much details right now. I just want to show you how you can build up a 2 node cluster and how easy this can be. By building up a cluster, you will be able from to centrally manage the proxmox ve physical servers and have access to the objects hosted on any of these servers. Note : I had limited hardware during this tests so I’ve created 2 Virtual machines and installed Proxmox VE 2.0. 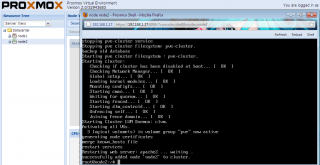 This post will just demonstrate how to build up the cluster. a coming post will focus on the migration and failover aspect of the cluster. Based on the Proxmox Ve Cluster 2.0 documentation, all nodes must be located on the same network. This can be a limitation if you want to place proxmox ve hosts on different locations with different IP segments. A workaround might be to implement a streteched VLAN infrastructure. The machines should be located on the same network because the replication model used relies on IP Multicast protocol. If you have an “unmanaged” switch, you do not need to perform any additional actions. If you have a “managed” switch, you have to ensure that it has been configured to support IP Multicast protocol. 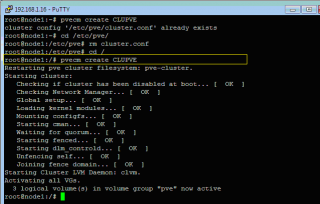 After installing the Proxmox VE 2.0 (beta) software on 2 machines (physical or virtual) using the settings defined above, you can move to the next step : building up your cluster. Note: If you need some help to perform the Proxmox ve Installation, you can have a look at this post. At moment of writing, you will see that the creation and configuration can only be performed from the command line. The process and logic of creating a cluster hasn’t change dramatically. If you compare the process of creating a cluster with the previous version and the PVE 2.0 beta version you will find definitely similarities. Okay, stop talking. It’s time for action. 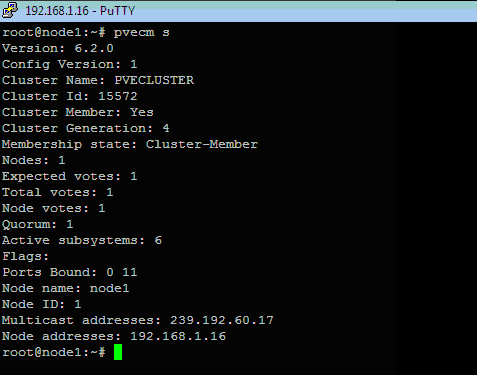 In one of the previous posts about PVE cluster, I was recommending to check that Date/time are in sync in both nodes. This recommendation is still valid. You have to ensure that both nodes are using exactly the same date and time value in order to be able to manage nodes from a central web management console. If they are not in sync, you can from the command line issue the following command to resync the hosts so they will be using the same time/date information. The first command will configure the day/month/year information needed to be used by the system. The second one will configure the time to be used. 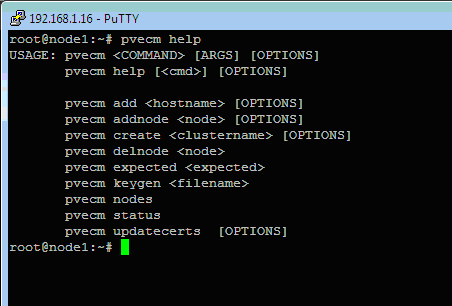 As you can see, the command line is really easy to use and there is not too much choices. The screenshot shows effectively that the first node of the cluster is basically a member of this newly created cluster. At this stage, you are ready to add an additional node into the cluster. Again, you can make a remote console connection through putty.exe (or the shell option available within the new management interface). When connected, you will need to issue the following command to have the node 2 joining the cluster. This means that in my case, I’ll type the following command pvecm add 192.168.1.16. To be clear, you provide the IP address of a node that’s already member of the cluster (and not the Ip of the node where you are working on). You will be then asked to confirm the fact that you want to connect to the remote host. Type yes. You will then be prompted for the password of the remote node (node 1 in my scenario). If everything went fine, you should be able to connect to one of the node (any of them) using your favourite browser and log into it. 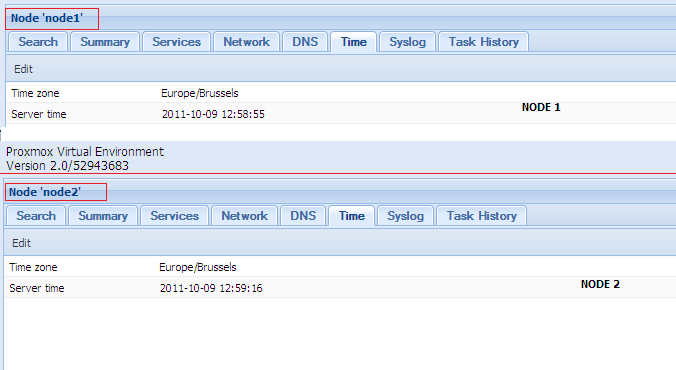 You will notice that within your management interface, you have under datacenter folder both nodes listed. From now on, you should be able to manage from this interface any nodes that are part of the cluster. As you have seen, the process of creating the cluster is really not too difficult. 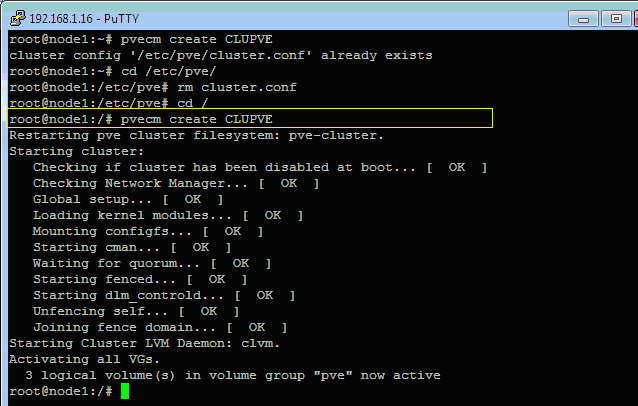 At this stage of my test, I do not know if the cluster provide high availability only at the PVE cluster or if this cluster can also provide HA for kvm virtual machines… We will check that in our coming tests. A final strange behaviour that happen to one of my friend when playing with the PVE Cluster is that after successfully creating the cluster, he was able to connect to the central web interface but when he was trying to connect to the other node, the login box was constantly prompting for the password. Guess What ! After some checks, we found out the the systems were not in sync and the prompt for credentials was due to an invalid ticket !!!! What about HA and how to resolve quorum disk? … and next week stop using windows… It will save you time, money, and will make you smarter. Thanks for your posts about pve 2.0. If you can wait a bit, I’ll have a look on it this Weekend. If I understand your problem, when you are adding storage to your PVE Cluster, the new storage element does not appear on the Web Interface. Does your nodes have the same configuration ? 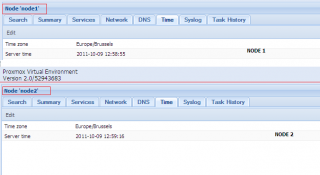 Are you creating additonal storage on both nodes ? are using the same name in both nodes(if you are using local lvm) ? I do not fully understand the problem (may be can you provide some screenshots on what you are trying to do ). What are you not seeing Additional storage within Proxmox Ve or created Virtual machines on these additional Storage ? Then from the Web Interface, connecting the the Master, I’m adding the local storage. I’ll be creating an Direcotory Storage type. At this stage, If I create a KVM machine, I can see the additional Local storage (I’ve call it Local2) and I can create the virtual disk on this storage. If I go to the storage section and browse the content of the Local2 Directory I can see my files. If I perform a migration operation to the slave node, then the vm disk will be visible on the Slave node. At this stage, I can see my additional storage and I can create KVM machines. Is this helping you ? Having the same problem with latest edition. The Web interface will work swimmingly for half the nodes and then the ticket will be invalid for the other half. Time is in sync, Any ideas? Invalid ticket is generally linked to date/time settings but you are telling me that this should be ok.
Can you double check that same time zone; date/time are set on your nodes). Logoff, wait a few minutes for the nodes to sync and try to login again ? If you want HA your gonna need a fencing device like an APC PDU AP7920 or AP7921. I was going down this road but opted for hot standbys instead! I’m using laptops as the proxmox servers so a PDU would be useless unless I took the battery out of the laptops. I like having the battery as an inbuilt UPS and do all my backups to an iSCSI target which can be hauled back to a hot standby at any time. Next I’ll be looking into rsync and RTRR with this setup.